Ukraine became the centre of world attention in the end of November 2013. One step away from signing of the Association agreement between Ukraine and EU, the Ukrainian Cabinet of Ministers has announced the suspension of the European integration of the country. This was the starting point in the mass protest action on the independence square that led to the change of government. 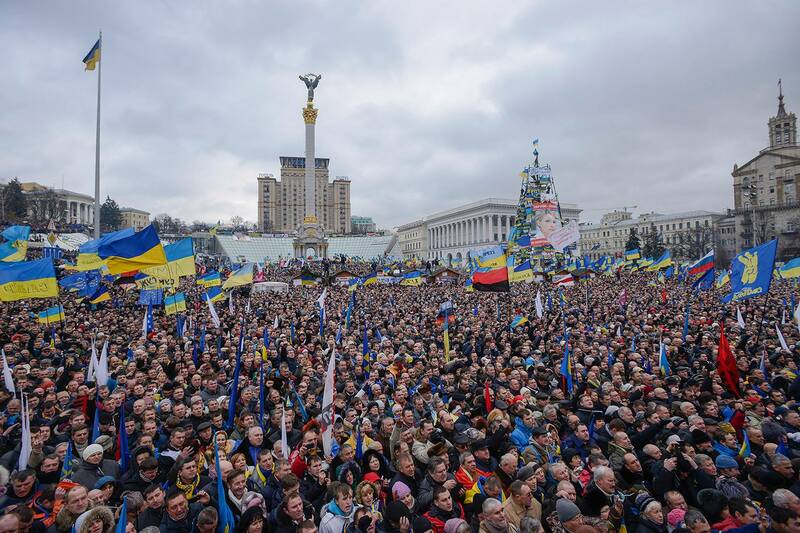 Widespread protest of thousands, now known all around the world as the «euromaidan», in December changed the tone and switched to a demand for the resignation of the government and the President. Inside, the protesters became separated between far right radicals and moderate opposition. European representatives participated in the political attempt to resolve the crisis. In particular, the first high representative of the European Union for foreign Affairs and security policy Catherine Ashton has held talks with Viktor Yanukovych on the peaceful settlement of the crisis. Yanukovych in turn invited the «opposition» to the negotiating table. However, in January 2014, the protests escalated into armed clashes between radical forces of opposition with Ukrainian police, which were caused by the vote on January 16 in the parliament, which by “manual voting” adopted the budget and a number of laws. The opposition was unable to respond adequately to the adoption of new laws and the radical activists took control of the situation. A group of activists attempted to assault the cordon of protection of the government quarter. Several hundred people came into clashes with police. They set fire to several buses of «Berkut», trucks, offices of the stadium «Dinamo», and have thrown firecrackers and Molotov cocktails at the police forces. In response, the police used nonlethal weapons: stun grenades, tear gas and water cannons. The White House on January 19th, urged the parties of the conflict in Kyiv to stop the fighting and has threatened to impose sanctions against Ukraine. Responsibility for the escalation of the conflict has been shifted by the administration of U.S. President Barack Obama to the Ukrainian authorities, who were «unable to recognize the legitimate protests of the people». On February 19 a counter-terrorist operation has been set in action, the following day unidentified snipers have been found. According to the Ministry of health of Ukraine, during these few days 75 people have been killed. On February 21, after talks between President Yanukovych and opposition representatives with the mediation of the representatives of the European Union and Russia an Agreement «On the settlement of political crisis in Ukraine» has been signed. However, the text of the signed document has not been recognized everyone. In the night of February 22 activists of Euromaidan occupied government quarter and made a number of new requirements - in particular, the resignation of the President Yanukovych. Thus, it can be stated that an unconstitutional change of power took place. Formally V. Yanukovych remains the official President, although, in fact, A. Turchynov has been proclaimed as the acting head of the state. Presidential elections have been scheduled for May 25. At the moment among candidates from the «Batkivshchyna» - Yulia Tymoshenko, Party of Regions - Mikhail Dobkin, «Svoboda» - Oleg Tiahnybok, the party «Udar» will support the candidature of Petr Poroshenko. In the light of the illegitimate change of the government and basing on the results of the referendum held in March, the Crimea region and the city of Sevastopol became part of Russia. In the East and South-East of the country keep growing popular requirements for a wide autonomy of the regions and the federalization of Ukraine.